*$86 for 24 months. Minimum purchase required. 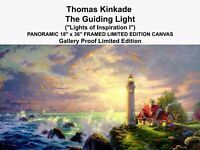 THOMAS KINKADE BROOKSIDE HIDEAWAY SAMPLE LITHO ON CANVAS FRAMED ART!